What… IS that?! An old BMW with a sidecar? It looks like it came right off a World War II battlefield based on the styling, heavy steel frame, ammo cans, military paint scheme and fox hole spade strapped to the sidecar. How old is it? WOW! What a cool looking rig. A restored antique maybe? No, the tag says it’s brand new! That can’t be right… can it? U-R-A-L. How do you pronounce that? 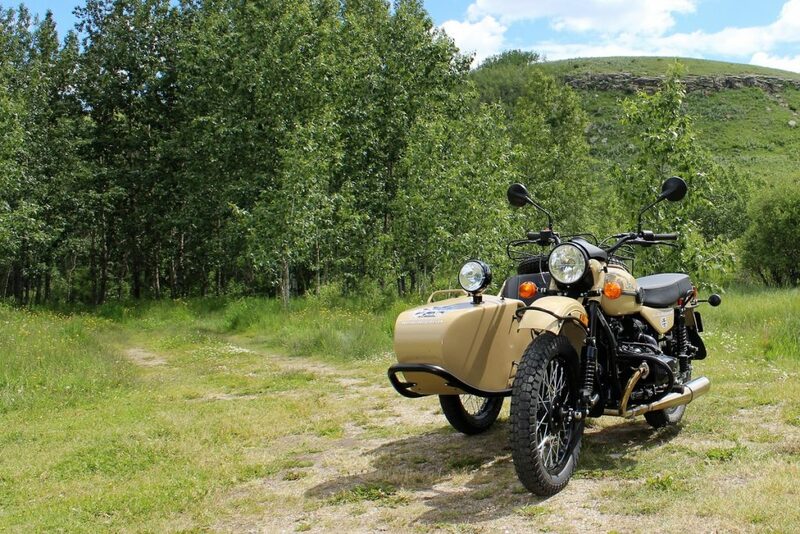 No one seems to say Ural the same way twice when they talk about it, but it’s named after the famous Russian mountain range close to where these bikes are built; The Urals. The original factory is still there to this day in a small, remote village in Siberia named Irbit, STILL churning out not just motorcycles with sidecars, but more interestingly manufacturing from scratch nearly all the parts needed to build the whole unit. The process has been modernized a bit since private ownership took over from the Russian State in 2000. As a result the quality of these bikes has significantly improved, all while staying true to the 1942, old world roots as much as possible. …the quality of these bikes has significantly improved, all while staying true to the 1942, old world roots as much as possible. They stopped building their own ignitions, alternators, controls and brakes opting to buy those from Ducati, Denso, Domino and Brembo instead to bring reliability up to modern standards. Happily, they also make the engines fuel injected instead of carbureted although I suppose some people would say that takes away from the simplicity of the original design somewhat. Current owners Ilya Khait and his wife Madina Merzhoeva feel strongly that link to the past is what gives the Ural its “mojo” (my word not theirs) and so they insist on keeping the factory in an inconvenient and remote location even though the corporate headquarters are now in Redmond, Washington, USA. Many of the workers in Irbit have been there 40 years building these machines by hand giving them an intimate connection, which is priceless to Ilya and Madina. A company valuing a self imposed sense of morality ahead of profitability is unusual to say the least, but there it is, unapologetically in living colour. I think they’re right and it’s quite inspiring. There are two versions of this story I could find. Both center around Joseph Stalin in 1939 ordering his Generals to better mobilize their troops to fight the impending Nazi invasion of Russia. 5 of the R71 bikes were secretly brought to Russia, dismantled, reverse engineered to create moulds and equipment to build engines and gearboxes for what would become the 1941 Russian M72 sidecar motorcycle. Ill-gotten gains for the Soviet Motherland. The other story is that since at that time there was a non aggression agreement in place between Russia and Germany the plans for the R71 were quite simply sold to the Soviet Government by BMW. It really was no skin off the Germans’ noses because BMW had already developed a new and improved motorcycle in the R75 and were ceasing production of the R71.Boring story though, the first one is much better and who doesn’t love a good story filled with intrigue and subterfuge? After playing a part in the victory over the German forces, M72 production continued and was sold to civilians in Russia. They became an important tool in transporting goods since they have a 1300 lb cargo capacity and are built to quickly cross very rough terrain found in battlefields. Many Russian roads were in worse shape than a bombed out European countryside from the sound of things, and these machines were in high demand all over. If it could be loaded up with ammunition, fuel and soldiers it could just as easily haul vegetables, flour, vodka, livestock or whatever else your “Babushka” needed brought in to a remote community. The simplicity of the design, ease of repair and ruggedness made it an easy choice. This off road prowess is a huge part of the heritage and swagger of the modern day Ural bikes. It surprised me to discover these are two wheel drive machines. I daresay they are better off road than on road even when not in two wheel drive. When a solid drive shaft is engaged in two wheel drive mode, the rear wheel of the bike additionally drives the wheel on the sidecar. There’s no differential so it’s a locked, positive drive system that is a brute in deep mud, snow, streams or other terrain that would stop a truck dead in it’s tracks or slow it down significantly. This off road ability isn’t obvious at first glance, but watch a few videos of the Ural off roading and it all comes into focus fast. If there’s a wide enough opening these bikes will go there. In 1953 the first Urals were exported outside Russia and today they are found almost everywhere. Popularity is on the rise in the US and Canada, especially in the last few years with more improvements being made gradually to fit and finish. Slowly, the Urals are being dragged into the 21st century. The Ural Comes With a… Reverse Gear?! The reverse gear isn’t electric like the ones you’ll find on Harley Trikes or Honda Goldwings where the starter motor is used and makes an ungodly sound like the engine is about to fly apart. The Ural has a shifter on the right side near the brake pedal that is shifted when the transmission is in neutral and the clutch lever held in to engage a true reverse gear. When you let out the clutch and give it some gas it drives backwards just like it would in first gear forward. Very slick and necessary in moving around a 760 pound machine like this. Okay Great… But Where am I Supposed to Mount My Machine Gun? 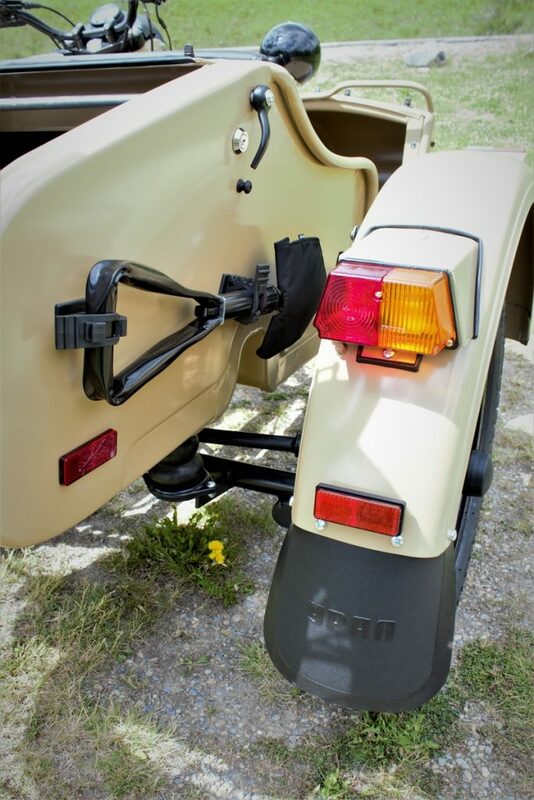 You’ll find optional spotlights on the sidecars along with shovels, gas and/or ammunition cans and even a machine gun mount if you’d like to have one… seriously! A machine gun mount. Windshields for passenger and driver are also included on the Patrol model and optional on others. You’ll find a very useful tool kit in the trunk along with a tire pump and a canvas cover for the sidecar when not in use. There’s enough room in the trunk to hold all that gear plus two full faced helmets with room to spare. It’s also really cool the way the Russian national anthem starts playing each time you open the trunk. Ok maybe that part was just in my head, but Ural should really look into making that a regular feature next year. 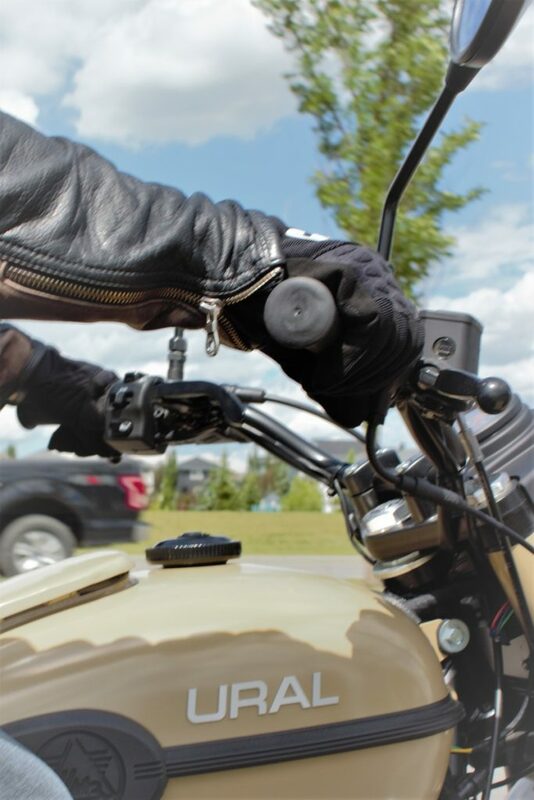 The spare tire can be mounted in any location on the bike by swapping over the brake rotor. There are 4 models to choose from in the 2017 lineup: CT, Gear Up, Patrol and M70 each with their own different options and paint schemes. 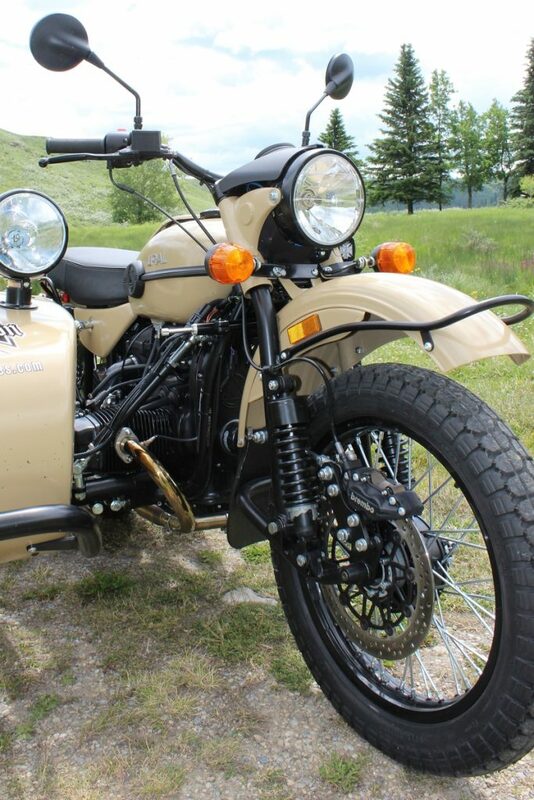 The CT and M70 are not 2wd and are priced slightly lower because of that fact, allowing people who don’t plan on seriously going off road the chance to save some money on their Ural purchase. It will cost you 895,743 Rubles to buy the higher end machines or about $15,000 American dollars. The value priced CT comes in at about $13,000 USD. 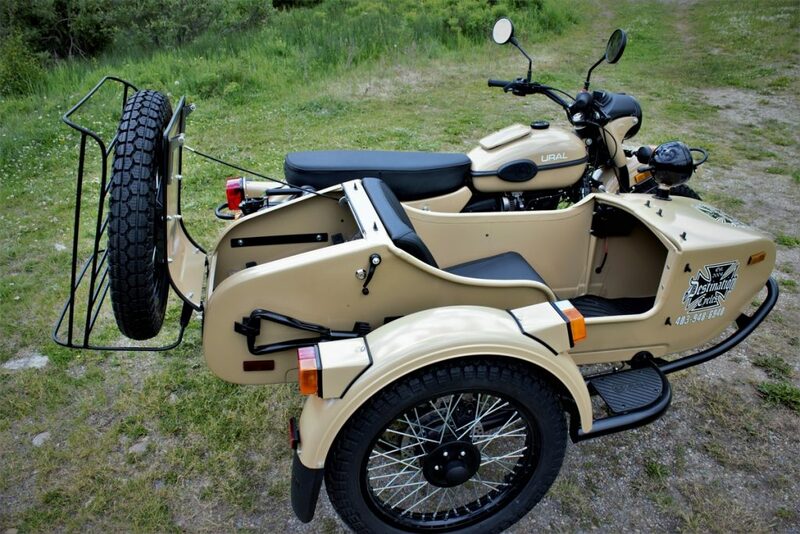 The price seems a little heavy at first, but is quite low compared to putting a sidecar on a different motorcycle with the same off road ability of the Ural. If you take a BMW F800GS at the base price it’s going to be about $14,000 easily (and you haven’t put a sidecar on it yet). 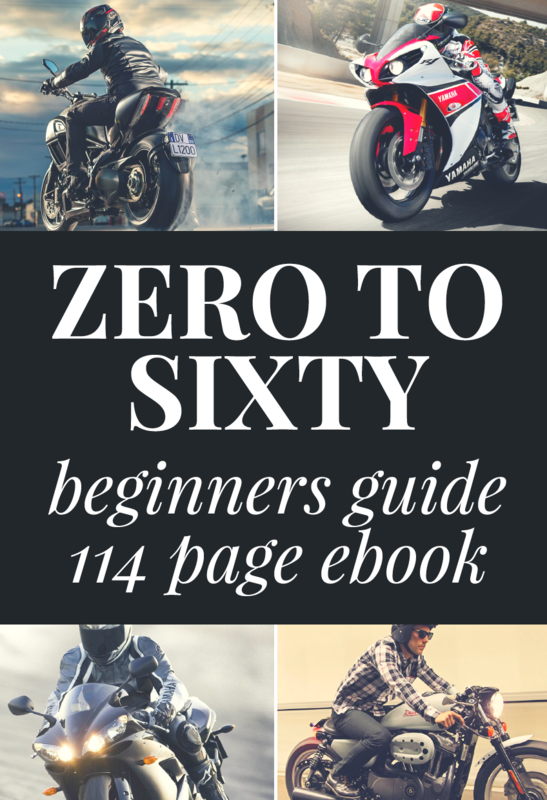 To do it right you will have to change the front forks’ angle to work with a sidecar’s different steering geometry requirements and build a sturdy subframe to connect the two together. This means you’re looking at somewhere in the neighbourhood of another $14,000 from what I’ve been told by people who have seriously looked into it, and it’s not 2wd nor does it have the history, ultra-cool retro appearance, support from the dealer network or warranty on the sidecar. 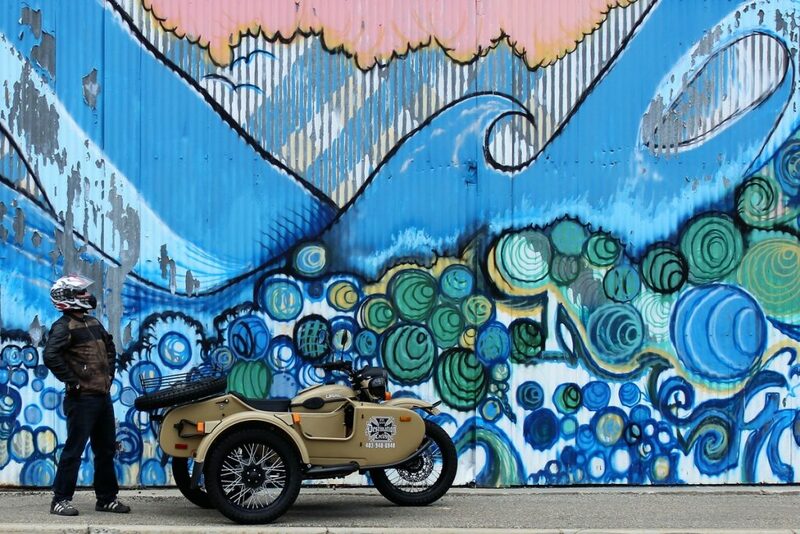 If you want a sidecar, the Ural is the better way to go. I did come across an interesting alternative sidecar option in my research. 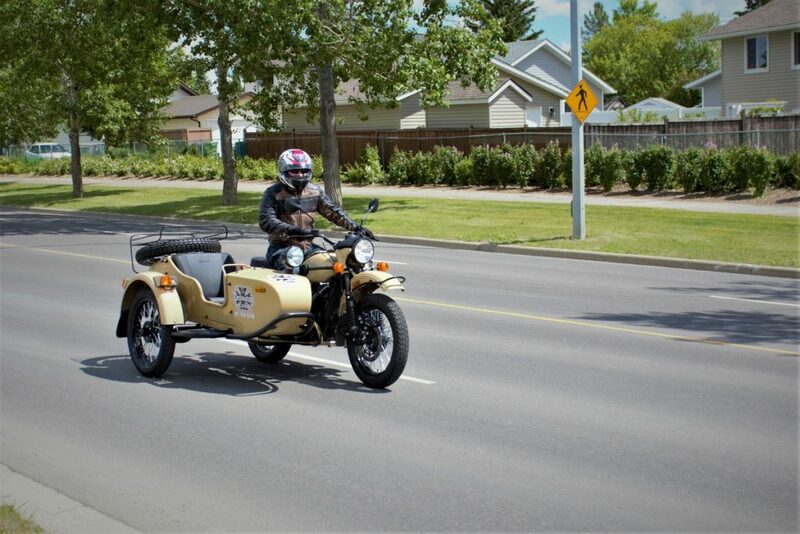 Jens Biederstadt from Edmonton, Alberta custom builds pivoting or leaning sidecars which can be easily attached or detached in a few minutes for many different makes and models of motorcycles. These units cost approximately $6,000 CDN. The pivot point allows the motorcycle to be driven normally unlike the Ural which can’t be leaned into corners when steering it. Jens says it’s been a very popular item in Germany on bikes for a long time, but at present he can’t build his sidecars to attach to bikes with low ground clearance like Harleys. He’s working on changing that though. This is a really good option if all you want is a sidecar on your bike to carry a passenger or some gear, but in talking to Jens about them I learned they are primarily designed for on road use or gravel roads at best and don’t hold a candle to the Ural’s off road reputation. Some of you reading this may question how reliable a Russian built machine could be. It’s a fair concern because in the early days all the parts were manufactured in Irbit out of the best materials they could obtain behind the “iron curtain.” This did leave a lot to be desired when it came to bearings, electrical and braking quality on the Urals. Machines built in the last few years are light years ahead of earlier ones because the new owners are serious about making these bikes a legitimate contender in the Adventure niche market. Recently a crew from Cycle World really put that to the test by riding 32 hours straight from Seattle to Los Angeles on an Ural and they had no real issues with it other than a low fuel warning light which they claim didn’t come on causing them to run out of gas. I would agree that the gauges are difficult to see in daylight, but wonder if lack of sleep had more to do with this. I was a little disappointed with their lack of enthusiasm for the Ural at the end of their record setting ride, and wonder why they failed to bond with the machine as I’m sure I would have. Here’s the best part, the driving experience. 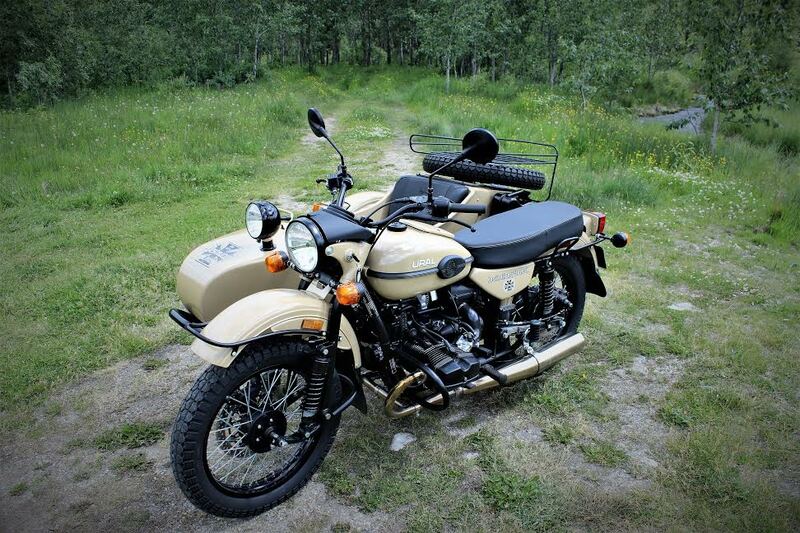 Destination Cycles is the local Ural dealership in my town of Airdrie, Alberta. For years now I’ve been captivated by the sight of the Urals I’ve encountered on the showroom floor. I’ve always wanted to take one for a test drive and just a few weeks ago the General Manager, Josh Radu made that possible by providing me with a demo unit for the day. The Gear Up model was the one I got to take for a 6 hour spin. I hate to admit it, but as I was being given some important driving tips by the staff I was having trouble taking it all in due to my excitement and eager anticipation of hitting the road. That might explain what happened coming out of the parking lot I suppose. If I had never learned to steer regular motorcycles by leaning and worked hard to make it instinctual I would definitely have avoided wandering across the center line of the road into the opposite lane, I’m pretty sure of that. It’s a sobering and dread-filled moment when you lean hard to the right, expecting the bike to come right, but instead it ignores you in the way I imagine a Russian bear would if you barked orders at it in English to make a right turn. Nyet, I go this way, now puny man. 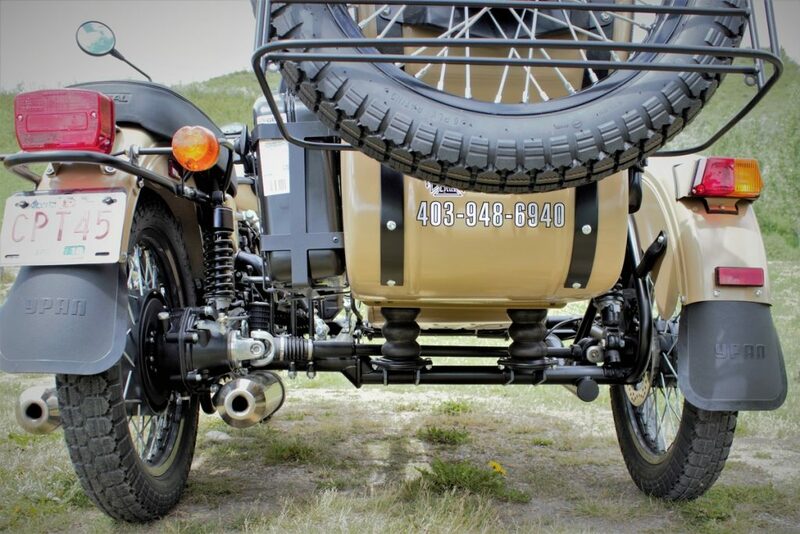 The key to driving the Ural is to forget nearly everything you know about riding and start fresh with the idea this setup demands some strong arm tactics and quick corrections like if you are actually steering a car and not a motorcycle. I knew this going in and yet it still caught me off guard… which made me laugh out loud almost non stop while riding the Ural. In a nutshell it means if you want the bike to go right, then pull harder on the right handlebar until it steers right. Same for left turns. It’s equipped with a steering damper to help keep things stable at speed meaning some heavy steering all the time. This isn’t to say it won’t steer properly or it’s bad, it’s just different. My next surprise came when I twisted the throttle hard to feel the power of 42 foot lbs of torque and the Ural started veering to the right! I corrected by pushing on the right handlebar to avoid hitting the ditch of course, but I also rolled off the throttle to slow down and realized when you do that, the bike will veer off to the left… so I was heading back out across the center line again! This is all normal for a non-leaning style sidecar equipped bike like the Ural because of the geometry involved when you have three wheels. It’s not balanced like a 4 or 2 wheeled machine would be, so there are what I will call “quirky” nuances a driver has to account for. Josh warned me it would take about 50 kms of saddle time to get the hang of it and that was bang on, how long it took me to adapt. Rolling off or on the throttle meant I had to correct for the veering right away to keep the bike going straight ahead. Add to this how when you make a harsh upshift the torquey boxer engine makes enough power to cause the rear end to wiggle or kick out in a snaky way and the Ural is a wild ride indeed. First of all, not having to put your feet down on the ground when stopped or worrying about the bike weight shifting unexpectedly and tipping over on uneven ground is a really nice change. I got used to that right away. The driver’s seat is quite firm, narrow and set high compared to most bikes. After a few hours of riding it was beginning to feel a bit uncomfortable, but I would say that’s no different than most bike seats in that regard. The riding position is very neutral, but what I found unusual was the handlebar and headlight position. They are mounted quite low and although I didn’t find it to be a problem, it was very noticeable just how much wind wasn’t blocked from my lower stomach area. On most bikes that area is blocked from the wind by the fuel tank, gauges or small fairings. The sidecar passenger lives in luxury especially if they have a windshield installed there. The seat there is very plush, wide and built at a comfortable angle to sit in as long as you like. My 6’2 passenger had no complaints about legroom or anything other than my crazy driving. We were both very surprised at just how nice life was in the sidecar. The front design has an name and style called “leading link”. The usually straight fork tubes instead bend back towards the engine just below the headlight and it’s a separate piece from the part of the forks which connect to the actual front wheel. Joining the two together are coil spring strut assemblies to soak up the terrain. 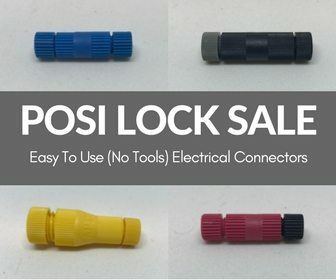 I had never seen this exact style before and was curious how it would perform. Turns out it does very well. It’s a stiff ride, but also with enough give to be comfortable. I rode up over a standard height sidewalk curb easily and comfortably. This came as no surprise really if you bear in mind this is a purpose built machine for very rough terrain. The urban jungle is no challenge at all for it. The rear suspension consists of two coil spring struts which also had a good feel to them over any kind of terrain I encountered. When turning sharply the suspension does move around slightly as the weight shifts, but not in a way that causes discomfort for the driver and passenger. It’s a fun sounding name isn’t it? “Flying the chair” refers to the action encountered when making a sharp right turn on a sidecar bike, when the center of gravity or load center shifts to the motorcycle only instead of the center point between the bike and sidecar which causes the sidecar to lift up in the air. When the sidecar tire leaves the ground at this point, magically your steering goes from being like a car back into motorcycle style and you have to lean and countersteer again. It’s really cool to watch a skilled rider purposely ride around while flying the chair with a passenger in there. Turning left is the exact opposite. Because the load center will move only slightly it allows you to turn wickedly sharp to the left. I couldn’t believe how tightly it would go, in fact. I was able to do a U turn around a median on the street at a much higher speed and twice as tight than I ever could on just a motorcycle. This was really fun to play with and see just how sharp of a turn could be pulled off. It really can just about literally pivot on a dime when going left. WORTHY OF NOTE: on a left turn if you grab a lot of front brake it will cause the rear bike wheel to lift off the ground! Some Ural riders like to do this on purpose to perform a bit of a trick akin to an “endo” type of maneuver. Obviously when the bike’s rear wheel leaves the ground all drive power is lost until it touches down again. The Ural is very much at home off road in 1 or 2 wheel drive and in the city because of its nimbleness, small size and ability to haul around a lot of cargo, but the highway is a bit of a stretch. It’s geared tall to build lots of torque for off road needs and as such has a very limited top speed of about 115 kph with a tailwind, going downhill under ideal conditions. Fourth gear really only works on flat ground to hold speed. As soon as I got to any kind of an incline the bike immediately started losing speed and I found really I just wanted to stay in third gear all the time since it could hold at about 90 to 100 kph on anything but the steepest hills. Josh told me the engine and transmission don’t mind staying in third gear at all and not to hesitate doing that. This isn’t a problem if you embrace the Ural lifestyle of taking the backroads and the long way around. Stopping to smell the roses along the road of life is supposed to be worthwhile and the Ural will be much happier if you do just that. I went to pick up my friend to share this experience with so that he could help take some pictures (which I hoped could be used at my funeral in case I didn’t catch on quick enough to drive the Ural safely), but more importantly so that I would have some weight in the sidecar to help smooth out the right turns. Having a 250 lb passenger definitely made the handling much better and as a side benefit all my maniacal laughter combined with tourette’s like outbursts of “This thing has a mind of its own!” and “It’s going to take us into oncoming traffic” really made him sweat at times. Another humorous moment came when after being near highway speed for about 20 minutes we both noticed a strong burning wiring type of smell coming from somewhere on the bike. I yelled out “something’s burning!” and we looked around frantically for a fire extinguisher and flames while giggling. Nothing seemed to have come of it until I looked at the speedometer which was trying in vain to convince me we were travelling 125 kph now. I gave up trying to know how fast we were going and just enjoyed the ride while trying to remember some good jokes to tell the police in case we were soon to be pulled over for speeding. I was right not to worry about it since after a stop for lunch the speedometer showed its resiliency by pulling itself together again somehow and carried on showing our correct speed minus any burning odours. 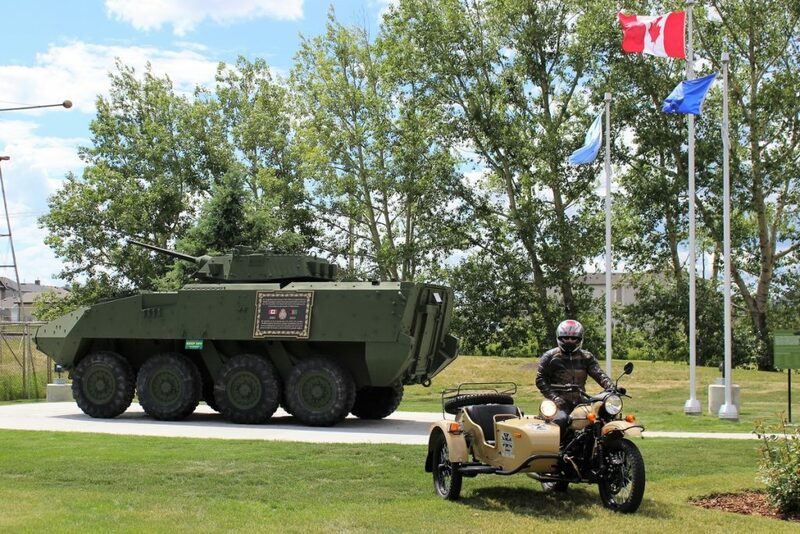 Yes the Ural is one tough customer. After I finally got the hang of bending the Ural’s will to my own it didn’t reduce the amount of time spent laughing at just how much fun it was to ride around in. The character of the bike is so charming, the styling so old school and the quirkiness right off the chart. We both came away loving this bike. I call this the UDF. The UDF acronym is already well known among Ural owners as the Ural Delay Factor. Anywhere you take these handsome steeds curious onlookers often will approach with a battery of questions. Good thing the owners are never in a hurry, eh? Instead of delay I experienced the delight factor in the hours spent cruising around the streets of Airdrie. I intentionally made sure to be out during rush hour to see how the air cooled engine would handle a hot summer day sitting in traffic, but also to see what people thought of it. Of all the positives discovered about it this was my favourite. It’s a real crowd pleaser. The bike is visually so out of place on modern roads, sticking out like a sore thumb much to the delight of everyone who lays eyes on it. Children, Teens, Adults and Seniors all were staring, pointing and smiling as we cruised along. More than a dozen gave us a thumbs up, hang loose and/or waves. Many couldn’t help cheer or shout out their approval without any holding back. Whenever we passed children staring out of the car windows I was sure to honk the horn in acknowledgement of the interest which only brought out more smiles and laughter. I loved that they loved it. I loved sharing the joy of motorcycling with many people who possibly had never tried it before. I think surprisingly the Ural is the best ambassador motorcycling may have since its non threatening appearance charms so easily. The irony isn’t lost on me that this was a machine designed for war and it ably served that purpose long ago, but here it is now making the day for so many onlookers and riders better and happier. How cool is that? Could we possibly count this as a priceless feature you won’t find on the spec sheet? I think so. So, Would I Recommend the Ural for a New Rider? Would I recommend this as someone’s first motorcycle? Yes, but with a cautionary explanation. It’s not really a motorcycle when it comes to driving technique and as such I would stress to a new rider they won’t be able to go from this machine to a regular bike in the future without first accepting to start learning almost from scratch again. This is not unprecedented though, since we have other alternative “bikes” like Can Am Spyders and Polaris Slingshots after all. It’s just SO different and I don’t mean in a negative way at all. To me it’s all positive for the Ural. It’s got a great heritage, a super simple design making it easy to maintain and repair. Not to mention a 2 year warranty with an option for 3 years and a growing dealer network for support. The off road dominance and load carrying ability make it unquestionably the greatest Adventure class bike hands down, in my opinion. If you want to travel far and in the most treacherous terrain it’s this bike you want as long as you’re willing to stay off major interstate highways and take the back roads. 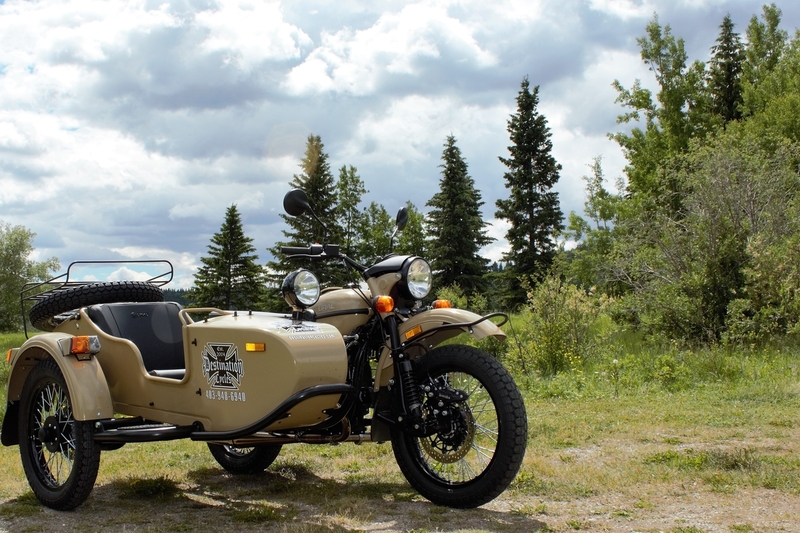 Truly, Ural owners are a bunch who march to a different beat and if you are the kind of person who wants something original that will always surprise you then it probably means you would love this bike.